An IPCC spokesman has now made it clear: Global warming is seriously worse than everything else anywhere and always that ever was bad. Worser than that. Seriously. Fields said, “the actual trajectory of climate change is more serious” than any of the climate predictions in the IPCC’s fourth assessment report called “Climate Change 2007.” Seriously … this time it is worse than serious. Well maybe. There is no doubt about which countries can’t keep their carbon emissions in their pockets. And it ain’t the West. So, sure, China and India are worse than serious polluters. Now a first year high school chemistry student can tell you that fire burns because of, say it together class, oxygen, not carbon dioxide. Most scientists know that what this planet does not need is more oxygen in the atmosphere. A 5% richer oxygen mix in the air — and wild fires would burn and burn and never stop. But carbon dioxide causes fires? Not on this planet. And the permafrost is going to melt? Not unless the planet gets much warmer than even the most dire IPCC predicti…. Sorry. I misspoke. This new predication is the direst IPCC prediction. Are you starting to see the pattern? The less evidence that is found for man made global warming … the worse the predications about the outcome of global warming. Remember the movie “Dumb and Dumber?” Al Gore and the global warming crowd need to produce a new movie: “Worse and Worser.” Seriously. Hmmm, reminds me of something I read as a child….. Seriouser and seriouser? No, that’s right, curiouser and curiouser. American Thinker has a heap of writers contributing seriously interesting articles. How can a person have confidence in the global warming caused by CO2 emissions theory when the temperature charts seem to be so full of discrepancies, bad data, data cleansing, poor placement of measuring equipment and indications of political manipulation? One of my favourite blogs is WattsUpWithThat because I am amazed at the number of problems there seem to be with what I would have expected was very straight forward basic data. Weather stations are often placed at airports. This makes sense on an efficiency basis, because aircraft pilots need weather information for take-off and landing. However, they are not great places for getting temperature data. Planes create heat from their engines. Runways are upgraded from grass to bitumen. Carparks are built and expanded. Buildings are built up and airconditioners and other heat creating plant built in. Many other weather stations are in urban centres. This also makes sense as weather bureaus want to give weather information to the largest section of the population. However, urban centres have also become more built up – more roads, more buildings, more heat producing car engines, air conditioners, etc. A weather station placed close to a building, and/ or with new buildings and new airconitioning condensing units blowing towards them would provide higher temperature readings over time as more of the warming infrastructure is placed around it. The problem here is the local environment of many weather stations have become warmer due to urbanisation, and don’t necessarily reflect climate changes. From time to time the powers that be deem the existing location of a weather station to be unsuitable and relocate it elsewhere. Sometimes the new location is more suitable, sometimes less suitable. The problem here is that the readings before and after the move are no longer comparable. A move closer or further from heat sources, up or down hill, into or out of breeze ways can change the temperature readings significantly from a move of even a short distance. A change in the use of the land in the district where the weather station is located will cause the local temperature to change over time. A change from forest to agriculture, or from agriculture to suburbia, or even suburbia to high density buiildings will change the amount of heat absorbed and reflected in the district. I have read a number of discussions about the accuracy and reliability of different types of equipment used for measuring temperature. While I admit I only understand part of it, I do understand enough that some equipment gives a warming feedback into itself by the way it has been designed. There is also the issue of calibration which I will include under human error. Not all weather stations are electronically interfaced with the recording and reporting authority. Many weather stations still require physical readings by a human being. Others give electronic readouts, but the data needs to be transcribed by a human being into the database or a communications system. There are gaps in some data sets because the person who is responsible for taking the readings didn’t do it that hour/ that day/ that week. Temperature measuring equipment needs to calibrated by the manufacturer and/ or installer and/ or maintenance staff. There are a few ways human error can come into the data. Apparently one doesn’t just collect all of the readings for a certain time and take the average to work out the global temperature. There is an algorithm which is used to take into account a number of factors, one of which I hope is the area covered. However, this algorithm and the data sets put into the algorithm apparently change from time to time. Possibly this is due to better understanding of how the data should be amalgamated, but it is also open to the suspicion of political interference. The number and location of weather stations around the world changes from time to time. There is a very interesting post about the change in the number of weather stations around the world from the 1950’s through to current times at M4GW‘s website. The figures and area quoted aren’t quite correct, but the official GISS website does report a gradual increase in the number of stations used from a few hundred in 1860 to about 3000 in 1950, then a quick increase to about 6000 in about 1970, and then a rapid drop in about 1990 from about 5000 to about 2500 stations. How does one maintain comparability of data with this degree of change in the source data set? Another interesting point is that there is much greater coverage of the northern hemisphere than of the southern hemisphere. Don’t two halves make a whole? There are different collections of temperature data, and each one gives a different picture. The best trick I have heard of yet is the allegation that IPCC stitched together the data up to about 1980 from one data set and the data from another source from 1980. This resulted in the famous “hockey stick” graph which purported to show the planet has been warming at an alarming rate. The recent trend in the graph was then extrapolated to show that in about 100 years time the global temperature would go through the roof. Such stunts do not do anything for public confidence in the global warming theory, particularly when it came from the IPCC. The above problems are with regard to weather stations which measure surface temperature. Satellite data is now available. Satellites measure the temperature in the lower atmosphere, not surface temperatures, so one would expect the raw data to be different, but the trends should be the same. However, can one have confidence in the published data from that source? How much of the planet is covered by these temperature readings? How often are temperatures measured at each point? What data “adjustment” is applied to these readings? Has anyone got the answers to these questions? Why argue with solid ice core data? You freeze water and you get ice. 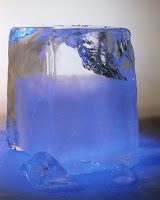 During the freezing process some of the air that is around or dissolved in the water gets frozen too. However, when the ice melts, the frozen air goes too. See? Back to my key credible source of information on global warming and climate change. 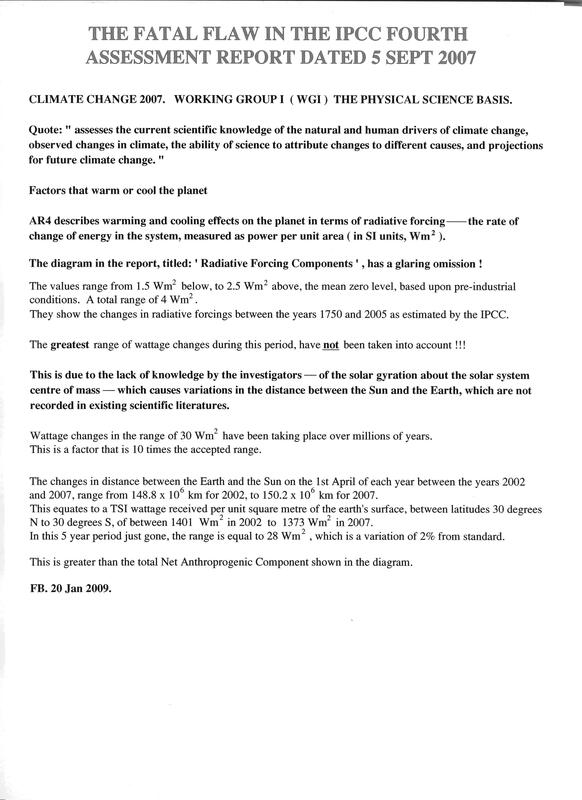 Page 33 of the IPCC Summary for Policymakers in the Climate Change 2001 reports has a great chart which illustrates the CO2 levels found in core ice which they somehow worked out was formed as far back as the year 1000. This shows very even concentrations of CO2 right up until more recent times when the scientists used direct atmospheric measurements (ie they used some real air). This is very impressive evidence that CO2 concentrations in the atmosphere were incredibly stable until the 20th century. When I read this graph I wondered what the ice core readings would show compared to the atmospheric readings for the past few decades. That would be really interesting! Hmmm. Maybe the ice core data isn’t available because the polar ice caps have been melting, not building up to provide evidence for us to study? Ahhhh! That’s why the CO2 concentration levels in ice cores are so consistent for the past thousand years! When there was more CO2, the world was warmer, the ice melted a little, and didn’t build up. There is no evidence in the ice of higher CO2 concentrations because the evidence melted! What interesting item will I find in these reports next?